The innovative machine-made cocktail glass Nick & Nora of the functional glass collection RIEDEL Barware ensures an effortless and chic sip, delivering the drink without forcing the tilt of the head perfect. 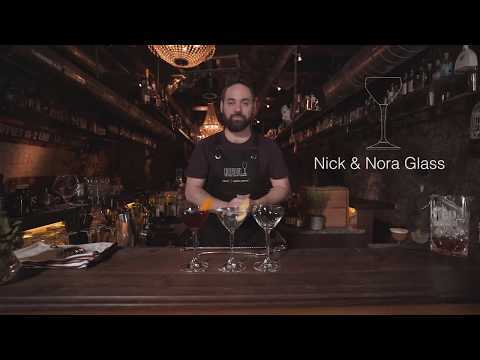 Nick & Nora is named after the characters in the timeless thriller “The Thin Man,” remembered for its mystery and martini-loving husband-and-wife detective team. The RIEDEL BARWARE DRINK SPECIFIC GLASSWARE is made in collaboration with spirits specialist Zane Harris, answering the need for cocktail-specific glassware among restaurants and bars with six glasses perfected for thousands of cocktails. The glasses are based off the traditional serves for seven classic cocktails: The Old Fashioned, Manhattan, Daiquiri, Sour, Peasant, Buck and Julep. Working in partnership with Riedel, Harris created each glass giving specific attention to its size, shape, volume and capacity for ice, a concept in its totality never before explored by any glassware company. “Ice has the greatest influence in glassware design as it is in practically every drink, not just the cocktail,” notes Harris. “RIEDEL BAR DRINK SPECIFIC GLASSWARE ice glasses are designed to seamlessly answer two of hospitality’s greatest frustrations– liquid displacement and the distorted consumer perception of being underserved.” Each unique glass in the RIEDEL BAR DRINK SPECIFIC GLASSWARE collection is crafted in Riedel’s familyowned factories. All RIEDEL glasses are dishwasher safe.